As promised, McLaren revealed the 600LT Spider today, with loads of new information and a set of exciting pictures. The 600LT Spider is the fifth McLaren model to wear the LT moniker and the second open-top Longtail after the 675LT Spider. Just like its predecessors, the 600LT Spider utilizes the Longtail formula of increased power, reduced weight, optimized aerodynamics, absolute driver engagement, track-focused dynamics and limited availability. 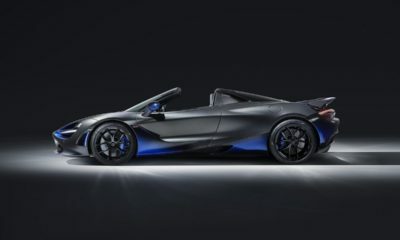 Starting with the powertrain, the 600LT Spider will utilize the same 3.8-liter V8 engine from the coupe that received revised electronic control systems, upgraded cooling system and shorter exhausts. Hence, power and torque remain the same at 600 hp and 457 lb-ft. The Spider of course is heavier than the coupe but McLaren engineers have managed to reduce the weight penalty to just 50 kg. According to McLaren, the 600LT Spider is at least 80 kg lighter than its “closest competition” and 100 kg lighter than the 570S Spider. Similar to the recently launched 720S Spider, the 600LT Spider didn’t require any additional strengthening to maintain its structural rigidity. Power to weight ratio stands at an astonishing 457 hp-per-tonne. The 600LT Spider will reach 0-62 mph in 2.9 seconds and 0-124 mph in just 8.4 seconds, which is a scanty 0.2 seconds slower than the coupe. With the roof raised, a maximum speed of 201 mph is possible. With the roof down, one would still be able to drive the 600LT Spider at speeds up to 196 mph. The three-piece retractable hard top will deploy or stow at the touch of a button at speeds of up to 25 mph. With the lowered roof, occupants will enjoy the aural drama of the top-exit exhausts that not only produce a wonderful V8 noise but also look extraordinary. If you are worried about the weather but still want to hear that V8 roar to its fullest, you can always open the rear window. You might have also seen videos of the top-exhaust system performing quite the flaming action. Coming to the aero, the 600LT Spider generates the same 100 kg of downforce at 155 mph as the coupe. A forged aluminium double-wishbone suspension system with re-calibrated dampers, firmer engine mounts and a lightweight braking system helps deliver the promised exhilarating driving experience. The 600LT Spider wears track focused Pirelli P-Zero Trofeo R tyres. The 600LT Spider is available to order now with prices starting from £201,500 with taxes in the UK. Just like the coupe, the 600LT Spider will only be produced for a limited period, so if you are looking to get one, we suggest you do it quick.